The UK-built fleet, known as the Class 800s, is among the first in the country to successfully test an advanced level of digital signalling. The technology is part of the Digital Railway – an industry programme for digital modernisation to increase rail capacity, ease overcrowding and improve performance on Britain’s rail network. Britain’s railway carries twice as many passengers as it did just two decades ago with demand set to rise dramatically in the years ahead. Digital Railway is the industry’s improved plan to tackle Britain’s capacity crunch by accelerating the digital modernisation of the railway, offering capacity and performance improvements sooner, at lower cost and with less disruption than conventional enhancements. 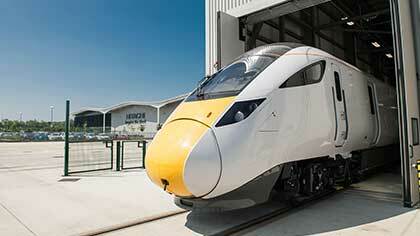 Hitachi is building and maintaining 122 new trains as part of the Department for Transport’s £5.7bn Intercity Express Programme (IEP) at its £82m rail manufacturing facility on Aycliffe Business Park. As part of IEP, new trains will begin running passenger services on the Great Western main line from autumn 2017 and the East Coast main line from 2018. Hitachi’s programme director Andy Rogers said: “Our new trains are helping to transform UK rail by using industry leading technology. “Passing digital signalling tests is a major breakthrough for the industry and another step towards easing the problem of overcrowding.